Today I sewed the dress, except for the sleeves and turtleneck. Cutting out the fabric. I am using a double knit with a good weight to it. The pattern is McCall’s 6886, modified to raise the front neckline (to make a mock turtleneck). The pattern has some extra ease in it, so I went down a size. 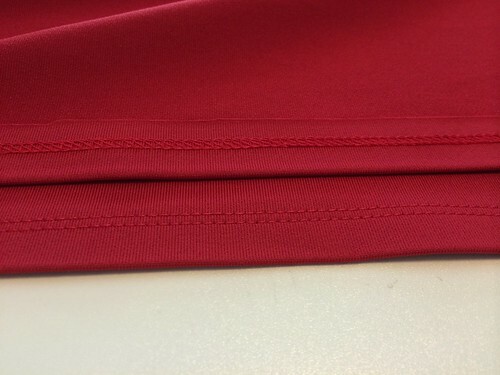 After cutting out the front and back pieces, I did a hem using my cover stitch machine. I pressed up each lower edge with a fusible webbing, and then sewed it with a narrow two needle cover stitch. And I managed not to get into a fight with my machine, so that’s a win in my book. 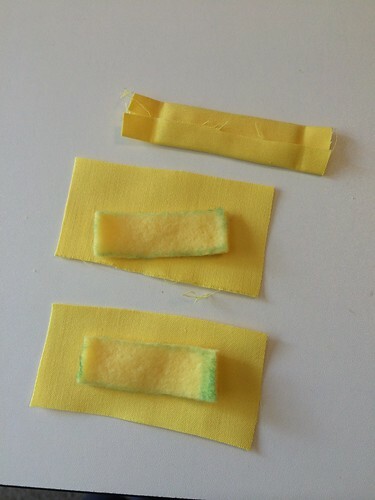 Next I had to make the yellow “laces” that are on the front of the dress. 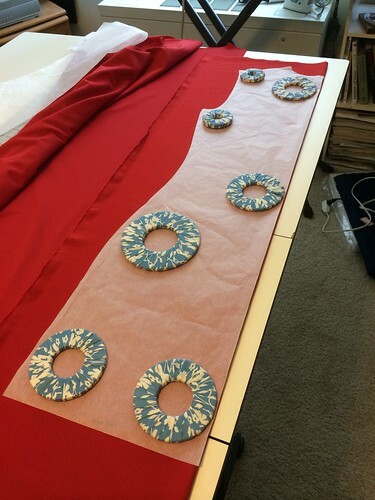 I cut three 1/2″ x 2″ pieces of polar fleece, and then covered them in cotton sateen. 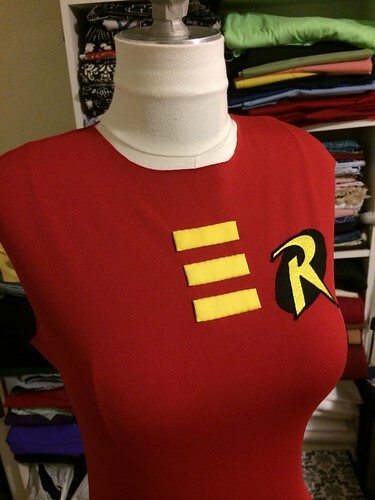 Then I sewed these three pieces down, along with the Robin logo patch that I had already purchased. 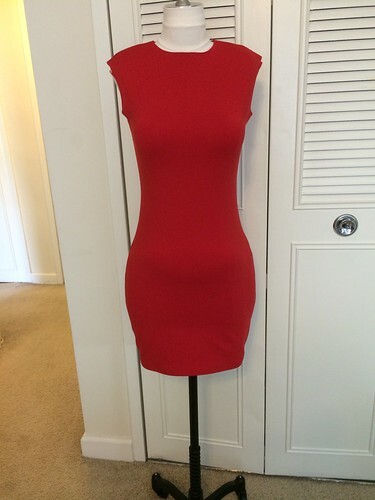 I still have to attach the mock turtleneck and work on the sleeves, then the dress will be done. After that, I have to make gloves and a cape. I have a pattern for gloves that I’ve used before, but I have to pattern the cape. Plus there is still the belt. I mentioned previously that I had been using Sculpey to mold the raised details on the belt. I baked those, and did a lot of sanding. 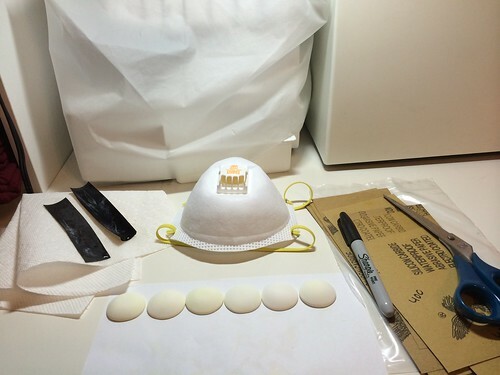 Folks recommend sanding Sculpey in water, to avoid getting the polymer dust airborne. You need to use wet/dry sandpaper, which is black instead of the normal brown/red color. I tried to be extra careful, and wore a particulate respirator mask in addition to doing the sanding in a bucket of water. It’s hard on your fingers, but the effort does result in a much smoother finish. 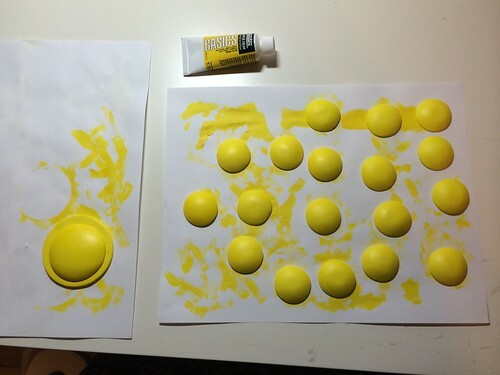 Then I painted the Sculpey yellow with acrylic paint. The bigger piece is going to be the belt buckle.